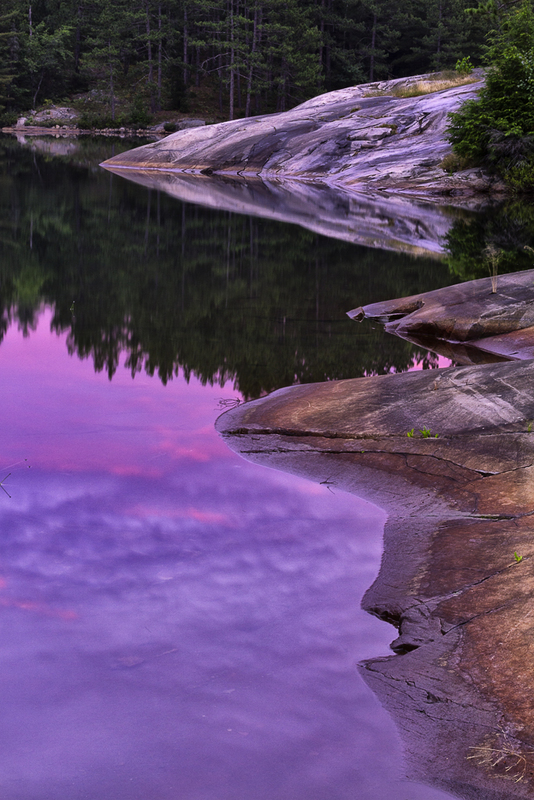 The above composition is another panoramic that I captured at David Lake, Killarney Provincial Park. It was late Sept. The Fall colors were not in there full glory yet. This composition contains two overlapping photos to achieve the desired scene that I wanted. The dark scudding clouds added to the mood. The blown highlights do not turn me on. That is were the morning sun was risen. The little rock islands have great texture that is common in this area. The addition of mist adds to the mood. The mist was coming off the land and moving from left to right. I believe the added colors of Fall in the forest in the background gives added contrast. You can just glimpse the La Cloche Mountains in the background. The weather here is getting warmer, snow is melting. Happy Easter to everyone. So until next time happy trails. 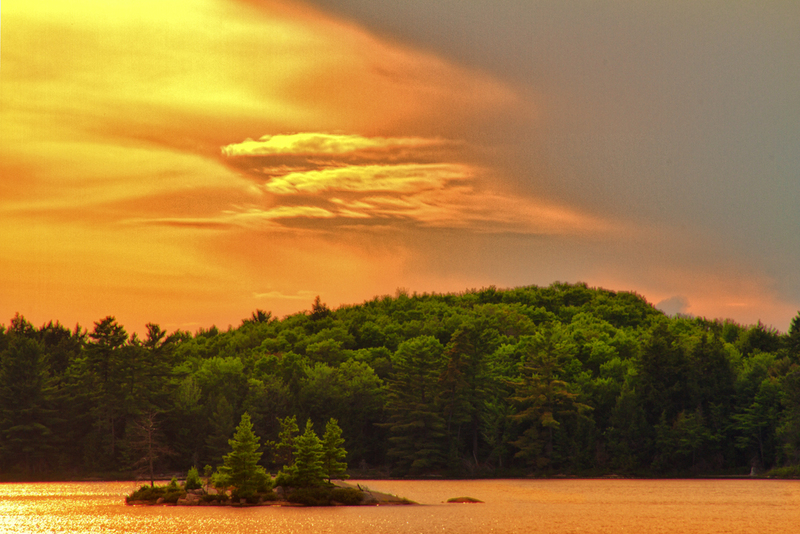 This is a scene I captured at David Lake, Killarney Provincial Park. The clouds were fast moving here. The wind was kicking up a fuss here and there. It was one of those trips where photographing was very sporadic. On the left is a point of land that I placed to the left of my composition. A small rock outcrop in the front adds a sense of depth. Two rock islands with vegetation in the middle ground. Then in the background is the far shore that is just starting to show Fall colors. The sun is rising at the far left corner. There is a touch of mist on the lake’s surface for added affect. The reflections tie in the composition nicely. This is a place where one could sit on a rock by the shore and enjoy a morning coffee. At the same time absorbing the surrounding landscape. A few minutes later the wind picked up and the effect was gone. Two years ago my wife Maureen and I made a five day trip into David Lake by Bell Lake in Killarney Provincial Park. After carrying over the first portage with our canoe and gear we took an extended break. This was Maureen’s first trip out since before the kids were born. That is going back at least thirty years now. I spotted Silver Peak to my left. There was a piece of narrow swamp leading my eye to Silver Peak. So I thought this might be interesting. Keeping some shoreline on the left to lead the eye to the swamp which you then follow up to Silver Peak. 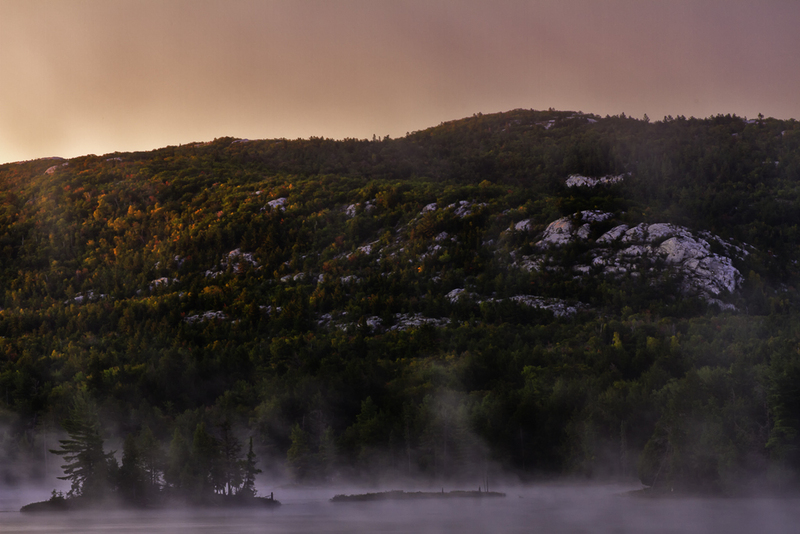 Silver Peak is the highest elevation in the La Cloche Mountain Range. It rises to a height of 1782 feet. Silver Peak is a very popular destination for hikers to take in the view from the top. I have just completed a softcover book through Blurb. There is also an ebook available as well. Check them out here. Well that is it for this week. Thank you for stopping by. Until next time happy trails. It is Wednesday morning and I am continuing from the previous post of our five day trip. After a leisure breakfast of coffee and bagels we proceeded to pack up our camp gear.Our destination was to head over into Boundary Lake for a couple nights.We had never been there before. We paddled to the upper end of David Lake and crossed over to the South shore.We had to do some searching but soon found the portage to Boundary.Donning our packs we hiked up the portage.Off the lake the portage was steep.Maureen disappeared ahead of me so I figured I would meet her at Boundary Lake.When I arrived at the end of the portage there was no Maureen.But I did view a really beautiful scene at the East end of the lake.Mean while I had to find my wife. Returning back up the portage there was Maureen coming with a big grin.She said oops.The portage crossed over the hiking trail.Maureen had turned left onto the hiking trail.She met up with a couple hiking the trail and they redirected her onto the right trail. Basically the portage was a steep climb one way and a long winding walk downhill.At Boundary we had to carry everything down to the lake shore before proceeding to the campsite.We met another couple coming out.We finally arrived at the campsite and unloaded everything. There is only one campsite for canoeing and one for hikers.The campsite we were at was nice but the view was not as good as the previous campsites we had been to. Wednesday and Thursday turned out cold and windy with not much in the way of photographic opportunities. Thursday, Maureen and I canoed along the lake shore.As we emerged from between two islands Maureen spied a Whitetail Deer along the far shore line.We quietly edged the canoe towards the deer.It turned out to be a eight point buck. Thursday night we both agreed to get up at 5;30 and pack our gear and head to the landing.There I would try to get some photographing in and we would have breakfast after the mornings shot. Friday morning arrived cold and foggy.We rough packed our gear and quickly made our way over to the landing.There was a bit of wind dancing here and there on the surface of the lake.It turned out to be a great morning to photograph.The above scene is one of the many photos I captured.This particular photo is interesting as the sun peeking through the fog lit up the side of the hillside to add some dramatic lighting.The fog creates mystery and depth to the photo.There is some fall color on the hillsides.We are a few weeks away from full color. While that is it for this week.So until next week happy trails. Monday morning at 6:00 a.m. we loaded our Ford Explorer and head for Killarney Provincial Park.This was my wife Maureen’s first canoeing trip in 34 years.We were going into the Park for 5 days for an extended stay on David Lake. I have been looking forward to this trip for some time.We arrived at our destination Bell Lake, our jump off point.It was a beautiful morning with very calm water.We proceeded to load all of our gear into the canoe and were soon ready to launch. We made good progress t to the first portage.Maureen and I carried our packs over the 745 m portage with a return trip to bring up the canoe.By this time Maureen was a little sore so we took a break before loading the canoe and moving on.After a short rest enjoying the scenery we head to the next portage of 200 m. Where upon we moved our gear over to David Lake.The wind was relatively calm making for excellent canoeing and we soon arrived at our campsite.Once camp was set up we proceeded to boil up a nice cup of coffee with a sandwich. The conditions were not much good that evening for photographing as the wind never let up.At this time of year the temperature will drop by nightfall and become quite cool.With a warm fire going and a mug of hot chocolate in our hands it was a cosy evening.Maureen was stiff and sore by now but happy to be here.It was not long before we were both tired and ready for bed. I awoke about 4 a.m. to heavy rain pounding on our tent along with thunder and lighting.The storm passed over rather quickly.We both rolled over and went back to sleep.I got up around 6 a.m. and quickly went back to bed as the wind was blowing fast moving cloud cover with a coolness in the air. Tuesday turned out to be not a good day in terms of photographing.It was a cold windy day with heavy cloud coverWe had each brought a book with us to help pass the day.Maureen and I did a bit of canoeing that evening exploring along the lake shore.At this time of year it gets dark early.For us that meant early to bed and early to rise. Wednesday morning dawned and I grabbed my photo equipment to see what I could come up with.There was still a slight breeze rippling the water but I managed to get the above shot.At this time of year there is mist on the water along with some fall colors.I believe that full fall color will not happen for another week.This area that I photographed is one of my favourite locations.I had about 15 minutes to shot and made the most of it. That is it for now. I want to thank everyone for there nice comments it is much appreciated as I enjoy sharing my experiences and photos with everyone.I also would like to take this opportunity to say that my wife was doing great on this trip and has come through like a real trooper.So until next time happy trails. My wife and I are packing for our trip into David Lake this week.I thought that I would do a short post before we leave.The above photo was taken on David Lake from my previous trip with my daughter. This photo was taken in the same location as the photo in my previous post Four Days in David Lake.I shot this one must tighter by going vertical.This allowed me to focus more on the rocks yet still show a beautiful reflection.The early morning light was superb.This photo was set up so that your eye follows the shoreline . The fall colors are still in the early stages here .Having said that I may not get much in the way of Fall colors this week. Well that is it till I return next week sometime so everyone have a good week.So for now happy trails. As I was going through my files from the previous trip into David Lake in Killarney Provincial Park I came across this photo.When I process my files from a trip, it is usually the obvious photos that catch my eye that I will process. I will then will go back at a later date and go through the files looking for that hidden gem. In the case of this photo I was really attracted by the cloud formation. With the dramatic lighting and the cloud structure available I took four exposures.The last exposure was taken to bring out the detail in the shoreline and island.The four photos of different exposures was processed in Photoshop using the HDR process. I use the HDR plug-in to open the shadows only then proceed to finish up in photoshop. The above shot was taken at one of our campsites on David Lake. The wind was not co-operating and we were lounging around the campsite drinking hot chocolate.There was a good view of the sun going down.The cloud formation you see appeared with its unique lighting.I was not long in setting up my tripod and camera. I was able to keep the island off – center and be able to keep the cloud formation in view.The sun was setting to the left so I purposely left it out.Due to the lighting on the trees I was able to keep the island from blending into the background.I think this is important as you can now create depth. Well that is it for this post.I thought that I would share this very dynamic scene which shows the beauty that can be had in our Northern Ontario Forests.